Can’t sleep. Can’t eat. Can’t catch my breath. The enormity and magnitude of the loss continues to descend on me in waves—increments of horror. Not just for the personal tragedy of my own family, but for the sheer scope of the loss of a community, a wildlife habitat, a history, and the thousands upon thousands of lives impacted and reeling. I am working all week here in San Rafael, California. What else can I do? My family members (elderly mom, aunt & uncle) are alive and safe. They need to focus on getting some practical things done. Turns out, there’s a lot to do when a wildfire burns your house to the ground. Volunteer options up dried up almost before they began. No one is allowed into Paradise except law officials, fire staff, and the military. Evacuation sites are overrun with help and locals are showing up with supplies and hugs. So here I sit, hundreds of miles away, helping patients at work, trying to “do” life—business as usual. I mean, life goes on for everyone, right? I think my glassy-eyed inertia this week was actually just paralyzing shock. I can barely get through the days. 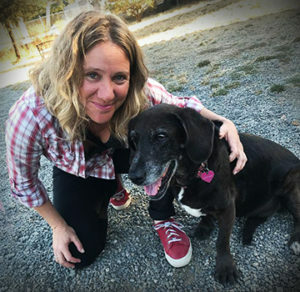 I’ve been getting out to take Maddie, my 15 year old basset/lab doggy, on limited walks while I breathe in the acrid air of my charred hometown. Can you imagine? That’s what I think about as I choke on the air, fight back stinging tears, and ply my body with water to stave off the headaches. This is MY home I am inhaling. The homes of my friends, their parents, their children, my childhood, my future memories. In and out of my lungs flow the screaming and terrified people, running, burning, scorched in their cars, their homes. The animals, helpless, fleeing or trapped in houses. This is actually happening. This is Paradise in my nostrils. It’s not there anymore. It’s here, in particles and ash scattered across the globe, disintegrating, dissipating, descending, now filling my lungs with the excruciating weight of a place I will always call home. Meanwhile, my family, hundreds of friends and thousands of families are trying to cope with catastrophic loss on every level. They are struggling for survival, seeking shelter, food and clothes. Navigating the practical aspects; the logistics of bureaucracy and insurance, signing up for this, making sure to cancel that. 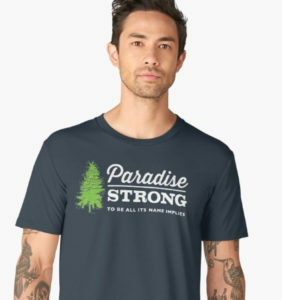 Everyone in Paradise is mitigating massive physical displacement and huge emotional upheaval. Waiting in lines. Running into neighbors. Relief. Hugs. Tears. Families scattered, but together. Joy and gratitude for some. Happy reunions. News of deaths for others. Agonizing searches. So many still missing. A dazed and bewildered diaspora—galvanized and forged in fire. Strangers are coming together to help each other with love and compassion. 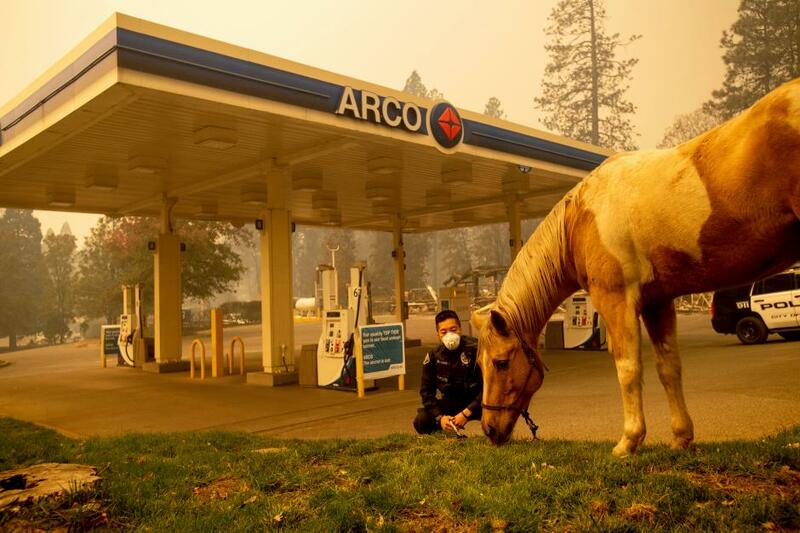 Animals are still up in Paradise alive, wounded, no water, no food, no safe way to get to many of them. Firefighters, National Guard, other officials doing the best they can to find and identify human bodies, bring water and food to abandoned or wild animals wherever possible, put out smoldering fires, locate trees and other structures still burning. They are trying to make the city safe enough for thousands of people to return to the carcasses of their homes, the charred shells of their former lives. But even if your home is one of the few hundred still standing, what will you be returning to? A singular home in the midst of a gigantic burned-out wasteland. There is no happy scenario for anyone living in Paradise or the surrounding areas. Sure, yes, there will be life again. People will recover. Humans are strong. They will rebuild their lives anew. But first, the scope, magnitude, and depth of the loss must be acknowledged, felt, and allowed access to our hearts and minds. I keep putting one foot in front of the other. What else can I do? But my limbs, heart, mind, soul are all numb from the magnitude of it, and I’ve only just barely begun to let it in.